Regardless of your political leaning, it's probably fair to say that the Bush 43 administration had both some positives and negatives for the United States, and depending on your politics that list goes one way or the other. It's probably also fair to say that most people regardless of politics – at least of honest character – probably consider Dana Perino to be one of those positives. The elevation of Perino as White House Press Secretary in 2007 brought this spitfire of a woman to national attention. Thanks to Fox News program The Five she remains an entertaining and informative national figure. 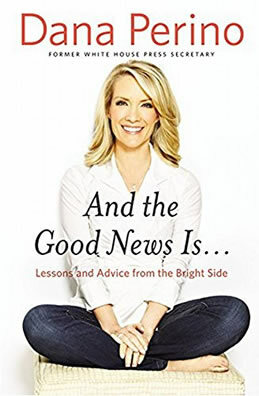 Chronicling her life both in and out of the White House is Perino's And the Good News Is...: Lessons and Advice from the Bright Side, a combination of a memoir, tales from the administration and life advice. Perino's sunny optimism practically radiates from each page, from her early days in Colorado, her clear admiration for George W. Bush and her busy life in the years since. It's almost impossible not to be a little more cheerful after each chapter. The first third is devoted to Perino's life before the White House, telling the story of her childhood in the American west. We learn how she met her husband Peter in a chance encounter onboard an airplane and the sacrifices the pair made for each other's careers, first moving to England where her husband was born, before returning to the United States and eventually making her way to Washington, D.C. to work for the Bush administration. Within the administration Perino began as a low-level press aide within the Justice Department, handling media inquiries in the weeks after the September 11 attacks. She ultimately joins the White House and is offered the Press Secretary position due to the unfortunate ill-health of Tony Snow. Perino has the unenviable task of dealing with a press seemingly intent on attacking the administration on every front possible. It was a mutually supportive relationship as Perino tells it. She defended the president against a press onslaught but in turn was counselled and supported by Bush, occasionally with advice, sometimes with admonishment and often with the proverbial thumbs-up. It's easy to see why Bush earned Perino's fierce loyalty, as he seemed to genuinely care about the people who worked for his administration and never seemed tempted to cut bait if they took the occasional misstep. Perino ends And the Good News Is... with advice both for readers and America as a whole. From her middle-class beginnings to standing next to the most powerful person on the planet, Perino is probably well-placed to offer counsel on both how to advance your career and how America needs to right their ship. Throughout it all is Perino's eternal optimism – it can and will get better, seems to be the subtext running throughout the book. Books by former administration officials tend to either be glowing or snide tell-alls and And the Good News Is... falls squarely in the camp of the former. Anyone hoping to see Perino take either supposed friend or confirmed foe to the woodshed will be dissatisfied as she rarely has a negative word for anyone. In another effort that might have been a disappointment but it is refreshing to see occasionally, a reminder that past the ideological battles there are people of good character of all political stripes. In Perino's capable hands the book doesn't come across like Ned Flanders, but an acknowledgement that everyone is fighting for their principles. And the Good News Is... is an engaging and relatable introduction to someone who has been in the public eye for over a decade but whom we only had a sense of. Whatever else you might think of the Bush administration, we can thank it for having the presence of mind to introduce Perino to Americans. Regardless of how long she remains a commentator, we can be fortunate that she'll likely be in the public eye for some time, sunny optimism and all.